As cloud popularity grows, so does the collection of free or low-cost online office tools that services like Microsoft Office Online and Google Docs/G Suite provide. However, those two major league offerings, along with a swarm of other cloud-based productivity platforms, are proprietary. Open source vendors have been promising a free open source online alternative. Until now, online open source office suites have been little more than vaporware. You can get your document work done fine using an open source local installation. Exchanging documents via email attachments or shared links to files stored on Dropbox and other cloud storage farms work reasonably well for low-level collaborative team tasks. However, the inconvenience factor kicks in very quickly when you try to handle collaborative tasks and need access to a continual stream of live edits. That is when a cloud-based open source office suite is sorely missed. Kolab Systems last month announced Kolab Now, a full-featured online office suite. The launch had the blessing of The Document Foundation, which gave up on fulfilling promises for a free open source online version of the LibreOfficesuite it sponsors. I used a demo account that Kolab Systems provided to review this new online service. Kolab Now is not free, but the office platform is powered by the LibreOffice core. A long-term goal of the LibreOffice community has been to release an online office application suite to do what Google and Microsoft do with their online collaborative suites — but without the proprietary hooks. The Document Foundation in 2011 said it was forking OpenOffice to become LibreOffice and would port the open source office suite to an online version. That was a big deal, because Oracle recently had taken over the OpenOffice community but made no promise to continue its active development. Despite its earlier plans, The Document Foundation later decided against trying to offer a public deployment of LibreOffice online. That endeavor would have been a massive undertaking. There was no source of reliable funding, according to Simon Phipps, a member of The Document Foundation’s board of directors, who expressed his delight to see Kolab Systems offering LibreOffice Online, maintained by Collabora Office as part of its Kolab Now offering. 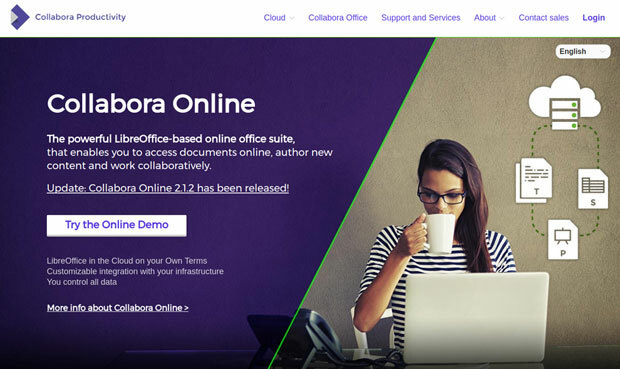 In a manner of speaking, Kolab Now piggybacks its customers’ access to LibreOffice Suite Online with Collabora Office online. That might represent a fine line between clarity and confusion. For a reasonable subscription cost , Kolab Now gives users a full-featured online document platform that supports live editing sessions and includes many bells and whistles. Kolab Now stores users’ data in a Swiss company’s cloud using open source, peer-reviewed and audited software. Basically, Kolab Now’s offering is a bridge to Collabora Online’s LibreOffice portal via a cloud-access overlay. 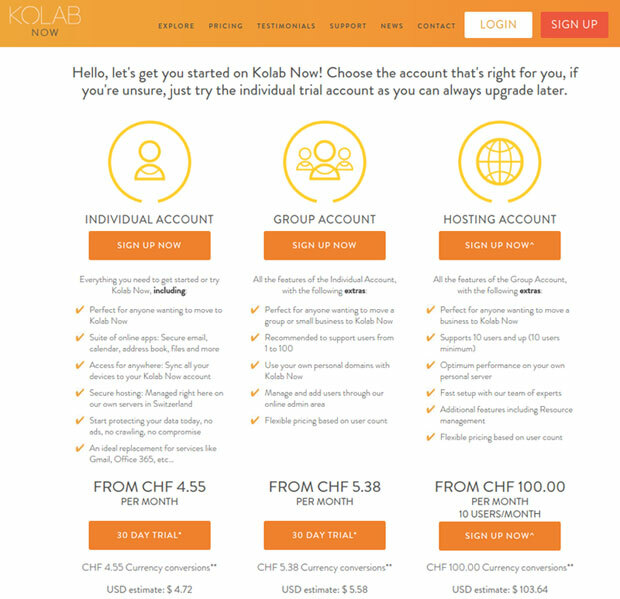 Kolab’s engineers developed the system around the dictates of the most privacy-conscious standards of Switzerland’s strictest privacy laws, according to Kolab Systems. 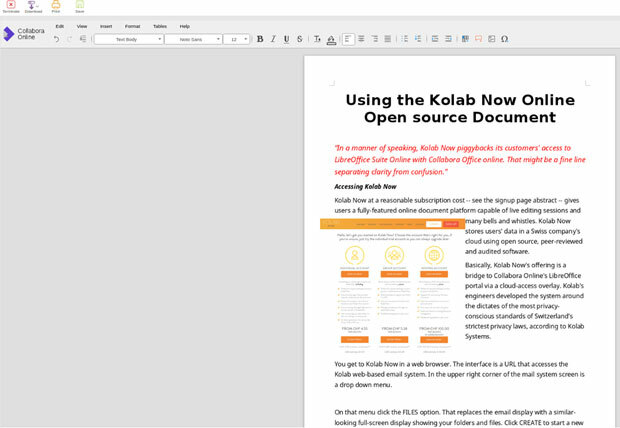 Collabora provides its existing LibreOffice online bundle to Kolab Now users. The dual-access options offer an unusual approach to putting an open source office suite online. You get to Kolab Now via a Web browser. The interface is a URL that accesses the Kolab Web-based email system. In the upper right corner of the mail system screen is a dropdown menu. On that menu, click the Files option. That replaces the email display with a similar-looking full-screen display showing your document folders and files. Click on Create to start a new document. Click an existing file name in the list to open or edit a file. Depending on the file type selected, the screen will display the file in the Collabora Online word processor, spreadsheet application or presentation editor. Kolab Now users first log into their Kolab email account and then click a link in a dropdown menu to access LibreOffice Online via Collabora Online. Is Kolab Now actually LibreOffice or Collabora Online? Well, sort of! it appears to be both. Collabora Online ] is a LibreOffice-based online suite. Collabora, the company, claims to be the driving force behind putting LibreOffice in the cloud. A team of certified LibreOffice engineers powers that effort. Collabora is a leading contributor to the LibreOffice codebase and community. The company has a proven track record with its Collabora Office for Desktop and Collabora Online products, which provide a business-hardened office suite with long-term multiplatform support. Kolab Now is a skin on the Collabora Online Development Edition (CODE) 2.1.2. CODE is a more conservative development edition of LibreOffice Online — aka “LOOL” — built around the Collabora Office core. Collabora Online grew from the company’s earlier collaboration with The Document Foundation on LOOL. Either way, both Kolab and Collabora offer what appears to be an integrated online office platform based on the open source code that drives LibreOffice. Both cloud-based products are available for individual users and office computers for a subscription. Kolab Now is available in three subscription options. Each gives users a fully functional online LibreOffice office suite platform for word processing, spreadsheet, and slide presentation applications. I did not pursue a cost comparison of Collabora Online to Kolab Now for two reasons: 1) the focus of this review is Kolab Now; 2) Collabora Online’s pricing is not available until potential users sign up for a demonstration or trial account. Overall, Kolab Now provided a satisfying user experience for me. I have used LibreOffice since its creation, and I used OpenOffice before then. That said, Kolab Now’s collaborative features are not as openly transparent as Google Docs. Where LibreOffice is lacking as a collaboration tool, Google Docs picks up the slack. However, anyone familiar with either of these products will feel comfortable using Kolab Now. It has only a slight learning curve. To create as real a testing environment as possible, I began writing this review on Kolab Now. Since no documentation comes with the online access, I forged onward doing what I do with any software product I review. I figured out how it works — or doesn’t work — and assessed the overall user experience along the way. My user experience was very good. My familiarity with LibreOffice made creating the review document and entering content hassle-free. The word processing features worked in much the same way that similar functions in the standalone LibreOffice application work on my computers. I formatted the document, added page designing features, imported graphics and so forth with ease. The user interface is the familiar LibreOffice screen in the standalone application from The Document Foundation. Kolab Now, integrated with Collabora Online, is not a dumbed down or partially crippled version of LibreOffice. I use LibreOffice as a locally installed application and Google docs for team projects and as a writing platform for some publications. All three of these office platforms have their own quirks. Kolab Now performs like LibreOffice to a point, but it lacks the feel of being an actual single application. Kolab Now is more of a document management platform than an online office suite. Starting with the Kolab Now logon, then bridging to Collabora Online, and then using what appears to be the LibreOffice user interface is awkward. While Kolab Now’s reliance on Collabora’s integration of the LibreOffice core seems a bit clumsy, it works well. Together, they support both Microsoft Office and LibreOffice document formats. That combined support takes some of the trouble out of using LibreOffice as far as file formats are concerned. Not everyone in a work environment has the patience to fiddle with the Open Document Format. Saving a LibreOffice document in Microsoft Word format does not always translate 100 percent in terms of page layout. I did not experience those problems with the Kolab-to-Collabora-on-LibreOffice arrangement. With Kolab Now’s office suite platform, users can work alone on a document or in a group, even simultaneously. That is how Kolab describes its offering. For example, one user can start a text document and invite others to a session. Several users can work at the same time on filling in cells of data on the same spreadsheet. You can not engage in those ways with LibreOffice on its own. Collaboration requires attaching copies of the file or storing it on a cloud service (like Dropbox) while you wait for participants to edit and re-save documents. Kolab Now and Collabora Online each provide that added live collaboration ability to LibreOffice. The collaboration element works much like the process used with Google Docs. In the upper right corner of the Kolab/Collabora screen is a user icon. Access its dropdown menu and entering an email address to invite a participant. Clicking on the link in the emailed invitation will give the new participant full access to the document. Any online platform runs the risk of being at the mercy of the Internet. In several of my trial-and-error sessions with Kolab Now, I was annoyed over delivery bumps. Getting logged on and transitioning to the Collabora Link sometimes was sluggish. Another annoyance occurred when I typed. I sometimes had to wait a few seconds for the letters to catch up with my fingers. When I initially accessed a saved document, it routinely would take up to one minute for the document to load. If I continued to work actively on the document, the connection would remain responsive. If I paused for too long to do anything else, I would see a transparent message across the screen when I returned, and I’d have to click on it to resume working. If I took too long to return to the document, the connection would be severed, requiring me to log in again and reload the document. I did not see any settings that allowed more flexibility in keeping the document live for longer time periods. That inconvenience can get in the way of maintaining workflow when checking notes or doing research, for example. Several times, my current session failed to save to the system. That generated an error alert. There seemed to be no way to correct the problem, other than copying all of the content and pasting it into a standalone local LibreOffice or Google Docs document as a quick backup. Kolab Now seems to be a duplication of services. Maybe its price provides a better option than Collabora to companies that need an open source online platform running LibreOffice. Perhaps providing the LibreOffice tie-in to a cloud-based email system is an added option not available with Collabora Online. As long as you can justify getting access to LibreOffice Online via a piggyback service, Kolab Now is a workable solution. It is difficult to assess its performance as a LibreOffice Online provider because it is just the provider of a tie-in connection through Collabora Online. Kolab Now is a unique offering that has the potential for working well.